The term science fiction usually conjures up visions of the future with spaceships zipping through the cosmos, futuristic constructs creating new habitats for humanity, and robots as an integral part of everyday life. These images are generally shaped by Western ideologies, where the future is all about progress, technical innovation and colonizing new planets, and rarely about improving the living conditions of oppressed groups. Afrofuturism shows how different our vision of the world to come could be. German literary scholar Peggy Piesche notes that Afrofuturism is often misinterpreted as Black science fiction where Black actors are simply cast in the traditional roles. But Afrofuturism should be understood more as a resistance movement inventing completely new science fiction worlds. Since the 1990s, artists and other creative minds have engaged with the phenomenon of African science fiction. The issue has been highlighted in critical discourse on pop culture, racism, feminism, and society, especially in Anglo-American countries, and was explored at the Loving the Alien conference organized by Diedrich Diedrichsen at the Berlin’s Volksbühne Theatre in 1997. Since then, German theatres in particular have put on plays with Afrofuturistic themes, while young artists like author Olivia Wenzel explore how alternative narratives can employ outer space as a trope for a utopian projection of equality. In her theatrical collage We are the Universe, which is based on texts, films and theories of Black science fiction, she addresses current events such as the Mars Expedition. In the feminist play First Black Woman in Space, German performer Simone Dede Ayivi looks back at the history of Africa and the African diaspora while also addressing the situation of Black women in the present day. In stories of liberation struggles and empowerment, Ayivi and her team show that Black female role models are not rare, and have simply been seriously underrepresented in public perception. BothGerman and Anglophone Afrofuturism differ essentially from Western science fiction. They do not completely overwrite tradition, mythology and even folklore with shiny, silver, robotic elements. Instead retaining African elements such as national costumes, architecture and landscapes is a characteristic of Afrofuturism. Films like Star Wars envision purely fantastical worlds, but Afrofuturistic science fiction is solidly rooted in reality. As an art form, it depicts a world in which people with African roots rebel against a purely White future and fight for equality. Writer and author of the book Afrofuturism: The World of Black Sci-Fi & Fantasy Culture, Ytasha Womack, explains that Afrofuturists are primarily concerned with overcoming social, ethnic and racist conditions. She cites “empowerment” as the guiding principle. Artists like Ingrid LaFleur and Martine Syms do not see a future in outer space. 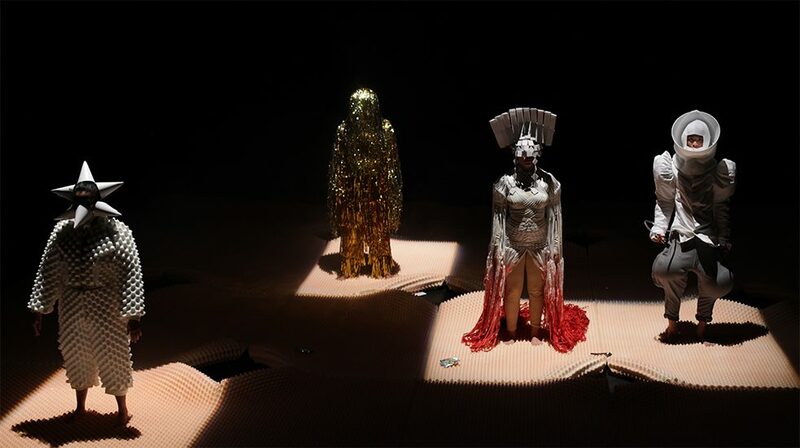 With her film Mundane Afrofuturist Manifesto, Syms created a kind of earthly alternative to interstellar living spaces, one that brings an Afrofuturistic destiny within reach and not light years away.